For once the preamble was not too daunting and we were almost reassured when we read that ‘each clue contains a misprint’. That is so much easier than being told that, say, sixteen of the clues contain misprints. We are on safe ground as we have to find one everywhere. I immediately highlighted those words ‘the incorrect letters’. I remember being told by an editor several years ago that the convention is for the ‘correct’ letters to spell out a message, but bravo Aedites for cocking a snook at convention and giving us all a nasty shock, as I am willing to bet that I am not the only solver who repeatedly had to rethink and insert the misprinted letter rather than the corrected one. Haven’t we all built up a whole library of Listener habits! With those names in place, we were able to complete the message down the side of our grid. SIGNING DEATH WARRANT SIXTEEN FORTY-NINE. That required another Wiki visit to see whether this was an anniversary (My initial suspicion had been that we were looking at a Guy Fawkes event but, of course CATESBY has seven letters and wouldn’t fit into that list of word-lengths of co-commissioners – or people who committed, as I had suspected!) No, it seems the events all took place in January 1649 (and, of course, in 1660 when so many of those commissioners had to flee or be hanged, drawn and quartered). We were solving full tilt but I did take a moment off to check whether Aedites confirmed his status as a member of the Listener tipplers’ club and he only just qualified with his ‘Hint of e[R]osin lacking in cocktail of retsina for herbal infusion (6) (RETSINA less R[osin]* = TISANE – a poor substitute for the usual wealth of boozy clues – ah me!) 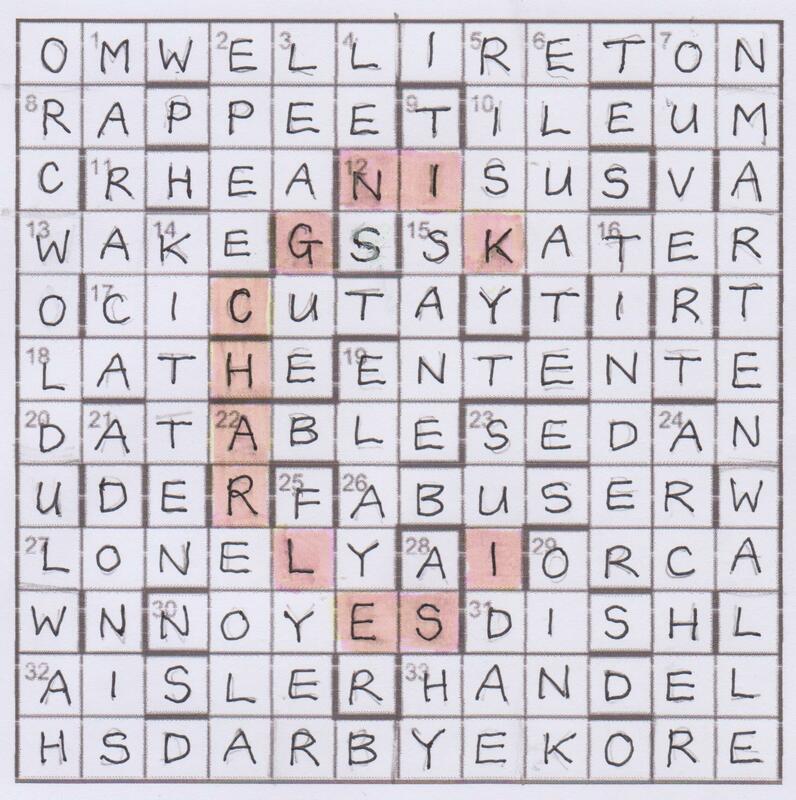 However, these were a convincing set of clues and our grid was soon full – or almost. We had a yawning gap at the bottom right and that clue ‘Swinish family of herself are dying in Glasgow (6) TEA produced nothing for the letters SU?DAE that seemed to fit the bill but we learned that SUID are porkers and there in Chambers was the pig family, SUIDAE. I am not really sure why DISH was the answer to ‘Distribute rare torpedo (4)’ DISH is ‘distribute’ and we needed an R misprint – Fare? And the Torpedo – is that an old wreck or a dish? A triple definition clue? Perhaps someone will put me out of my misery. Misery – yes, there was the usual grid stare at the end of our solve and we could see KING CHARLES 1 in the shape of a C. The victim ‘appearing symbolically in the grid’. Is a C a symbol. I checked with Chambers and decided that a letter probably is a symbol so those had to be the twelve letters we were looking for. No complaints. This had to be the quickest solve ever for us – just a little over an hour – but it was very enjoyable and left us with a glorious autumn weekend to enjoy. Many thanks Aedites. This entry was posted on 8 November 2013 at 5:00 pm	and is filed under Solving Blogs. Tagged: Commission by Aedites. You can follow any responses to this entry through the RSS 2.0 feed. You can leave a response, or trackback from your own site. Anyone notice that at the base of CHARLESI is a jumble of letters spelling HEAD – and the two combined are in the shape of an executioner’s axe!! Anyone else notice TUART going diagonally then down from the T of IRETON? I thought that was the notion of him losing his head, plus CHARLES in the expected place, giving 12 letters to highlight. I wasn’t convinced though so didn’t send it in. Just as well as I had LENT for 4dn.